It’s well documented that I drive to work. Occasionally, I have meetings first thing in the morning so I drive directly there and meet my work colleagues, who usually arrive by train or Luas. Then, the meeting ends and I obviously have to offer them a lift back to the office. At this time I love my cyclist colleagues most of all, they spare me the shame of accepting a lift and head off to their bikes. It’s six years since I went back to work after my first maternity leave, so I have finally learned that I should decontaminate clean my car before these meetings happen. The learning moment happened when a colleague, dressed in a beautiful white silk outfit, went to open A REAR DOOR of my car to get in. I threw myself in front of her mumbling about Liga and raisins while trying to extricate the (possibly) clean fleece blanket from the boot at the same time. My other colleague who was coming along, dressed in darker, machine washable clothes, swooped in and requested to sit in the back. I loved her almost as much as the cyclists. Because I drive the family car to work. The MPV. The Mammy-wagon. The car that brings three children on four-hour-journeys to visit Granny in Sligo. Journeys fuelled on raisins, breadsticks and juice, then biscuits and whatever else will keep them quiet from Longford onwards. (The kids, not the car). It’s also the car I commute in, where I spend almost as much time each day as I spend in my bed. This means my car holds spare shoes, Vaseline, nuts, sunglasses. Stuff. Lots and lots of stuff. This stuff does not reside in the roomy centre console. That’s where the chargers for our old phones and broken ones for our current ones are. And a plastic dinosaur, and some CDs. And that pen I couldn’t find. 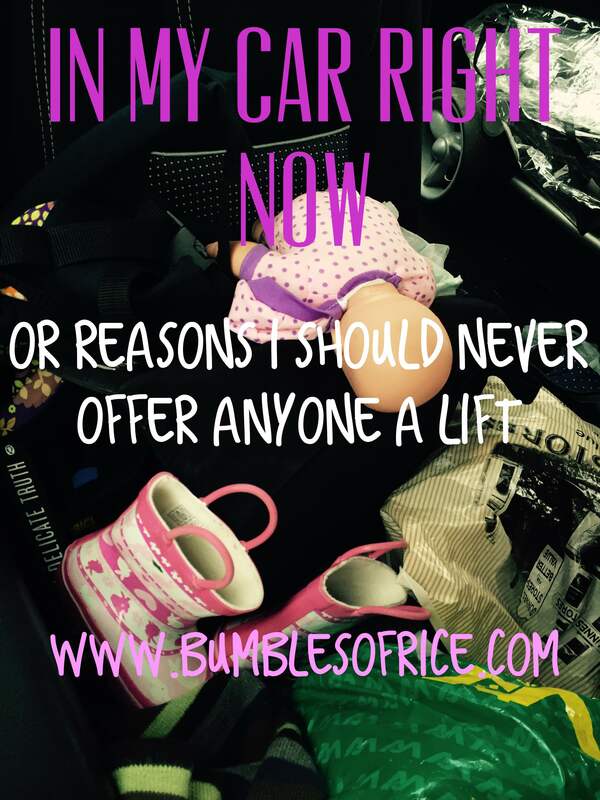 This stuff and kid stuff are the reasons I should never, ever offer anyone a lift. At least without either cleaning it beforehand or getting them to sign a non-disclosure agreement. And maybe a waiver for the destruction of any valuable clothing items. This might give you a better picture. Not much room for any people, let alone extra people! Dear Colleague, if you read this and I’ve given you a lift, please appreciate the effort, because obviously I’ll pretend that the car is a state and that I haven’t had a chance to clean it. Tell me I’m not alone? Please? car, honest, kids, lists, mess, parenting, working mother. Bookmark. I’ve had young kids comment on how dirty my car is … morto! HATE having to offer people lifts. I am so glad you wrote this post! Even a pricey car valet will not fix the problem… the upholstery is permanently stained by God knows what (and it is dark coloured). I’ve considered trying to drape a blanket over it but then the belts won’t work… and yes they are often jammed with food waste (I’m squirming just thinking about it). You are brave Sharon. The car certainly gets used as an extra storage area here too. And yes, the raisins always seem like a good idea at the time. This is my life too and I also hate when friends etc say “ooh please don’t mind the state of my car” and it is pristine!! And GAA season has started so that means muck, grass, hurls, helmets,shinguards etc on top of all the normal messiness. You seem to have spelled hurleys wrong hahaha.. The back seat of our car is just like this. I am mortified if anyone hints at getting a lift! It’s a hurl on my side of the river!